By the first week in March the wisteria was in full bloom in the garden at Casa Mosaica and attracting plenty of the big blue Carpenter bees and although I am not sure exactly when they first arrived, the house martins were already back, busily tidying up their nests at the front of the house on the 20th February...Spring comes early in Andalusia. I am keeping my fingers crossed that I have not entirely missed the jasmine officinale, the first of the jasmines as I adore the powerful scent and have just seen it called “The Poet’s Jasmine” on a website which seems to me a great name as I can imagine it might well inspire poetry. We had fabulously good weather in February and early March as you can see from the bluest of skies in these photos. First of all my very best wishes for a brand New Year...2019 already nearly 2020 where have the years gone! And I hope you all had a very Merry Christmas! Starting to write this from dark and damp London I wish I was in Gaucín with its expansive views and magical landscapes as well as escaping the politics in the UK. All being well and excluding further drone activity at Gatwick I should be snugly ensconced at Casa Mosaica by the time you read this. 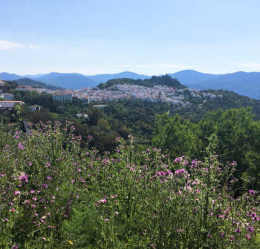 Welcome to my rather late Spring Newsletter, a bit like the start of Spring this year in our beautiful Sierra de Ronda; after weeks of rain the weather remained cool with some wonderful days until the beginning of June. However the wild flowers were exceptional everywhere which made the walking and the views really wonderful. I was lucky enough to be back in Gaucin to see the almond blossom at its most stunning against beautiful blue skies; it’s the time of long shadows, wood fires and cold nights…. mid February. However the countryside was dry, and the lack of rain was the subject of many conversations. Nonetheless this is a very good time of year to enjoy walking around the area and there are many delightful walks of varying difficulty and places of interest to take in, or restaurants on the way/ at the end of the walk…which is often what we seem to do!…Bring layers, binoculars and cameras. Best wishes, Happy New Year to you all and welcome to our Winter Newsletter. The autumn weather in Andalusia was extraordinary last year. At the beginning of October it continued to be extremely warm. By the end of October we were still able to visit the empty beaches and enjoy afternoon siestas in the sun after long, delicious lunches. Even better than mid summer...no crowds, no traffic and much gentler heat. I hope you are enjoying the summer holidays wherever you are this year. Since I last wrote in April we have had a very busy summer in Gaucin. As you can see by the picture below, Casa Mosaica was almost swallowed up by the sweetie stall at this years Annual Feria from the 2nd - 6th August. The Feria is a vestige of the ancient livestock fair, the event is now in honour of patron Virgen de las Nieves (Our Lady of the Snows).